One of a long series of Haefeli cartoons on upscale — this is the New Yorker, after all — gay male life in NYC, or a metropolis very much like it. (I have fifteen of them framed in my living-room, in there with the penguiniana, mammuthiana, family photographs, and so on.) Yes, trendy diners are very much part of the scene (independent of sexual orientation, so far as I know). 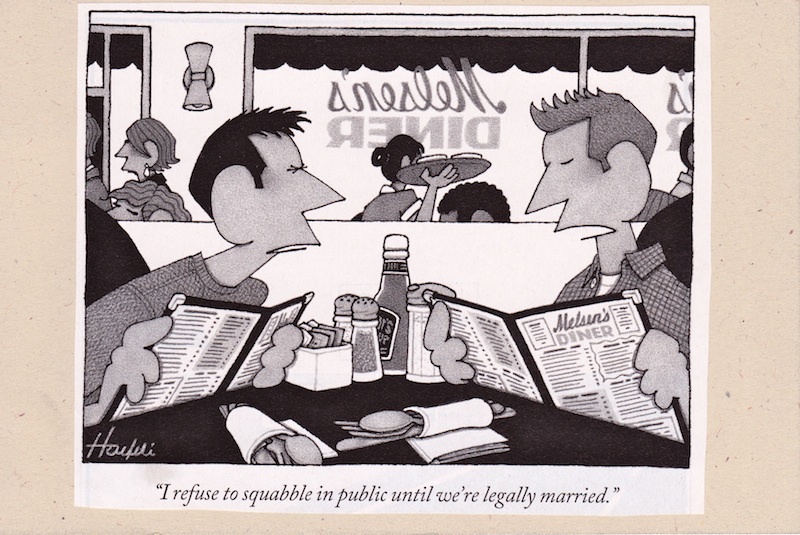 No squabbling in public. What about arguing? When does a disagreement devolve into squabbling? How much of it is in the manner of the disagreement, and how much in the topic? Also note the crucial modifier legally. This entry was posted on June 30, 2010 at 4:36 pm and is filed under Linguistics in the comics. You can follow any responses to this entry through the RSS 2.0 feed. You can leave a response, or trackback from your own site.